Circa 1930’s house. Note the different roof lines all indicative of improvements over time. 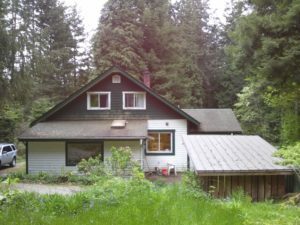 A Roberts Creek home inspection of an old timer with brush and forest invading its space. Some selective clearing on the property can have big benefits to the buyer. Whenever I do an older home inspection, I value the history and construction techniques that these older building have to offer. In particular I look for how they have literally “weathered” in our wet, west coast climate. From my experience, the biggest threat to any house is water penetration and moisture damage. Protect the building from water entry and the majority of your problems go away and the immediate environment plays an important role. Case in point. A house was recently inspected on Lower Road in Roberts Creek. One of the striking features of this area is the forest and how homes are set within this environment. A buyer can easily forget that 80 years ago the trees would have been quite a bit smaller or non-existent. In this case the house was well shaded by giants and the branches were overhanging the roof. So the landscaping now impacts the building. How so? Shading can play a dramatic role on how quickly the building envelope will dry out from rain or snow. The longer the surface is wet, the more time moisture has to do its work on the surface. In this case, decks and siding will rot faster and moss grows on all parts of the roof, not just the north side. Does the homeowner value sunlight? If so then, they may be disappointed for its lack on their property and a deck become less used and a glass solarium may not be used at all. Foundations, buried services (water, gas), septic fields, driveways and gardens are all negatively impacted by the size of the trees, their roots, the length of the branches and the shadows cast. All this can lead to a costly remediation… judicious tree pruning or cutting it down completely is usually required. Even the root ball can be massive and may pull at a buried water line or disturb a septic field during its removal. For older properties, external landscaping considerations play an important role to keeping the building structure “healthy” and should not be overlooked when making a purchasing decision. Otherwise the landscaping may limit the owner’s pleasure and intended use of the property.